Something got into me a couple of weeks ago and I decided for no particular reason to try to make some hand-cut dovetail joints. The results were not good at all, partly because I don't have a proper dovetail saw, but mostly because my saw kerfs were not even in the same county as my cut lines. So rather than upgrading my saw and simply repeating the failure with a different tool, I decided to try a method I had read about in separate articles by Lonnie Bird and David Marks. These guys both cut their pins first on the bandsaw, using a system of spacers along with the bandsaw's fence to guide the cuts and to establish the layout of the joint. After chiseling out the waste between the pins by hand, they then mark the tails and cut them freehand on the bandsaw. Finally, they chisel the waste from between the tails to complete the joint. 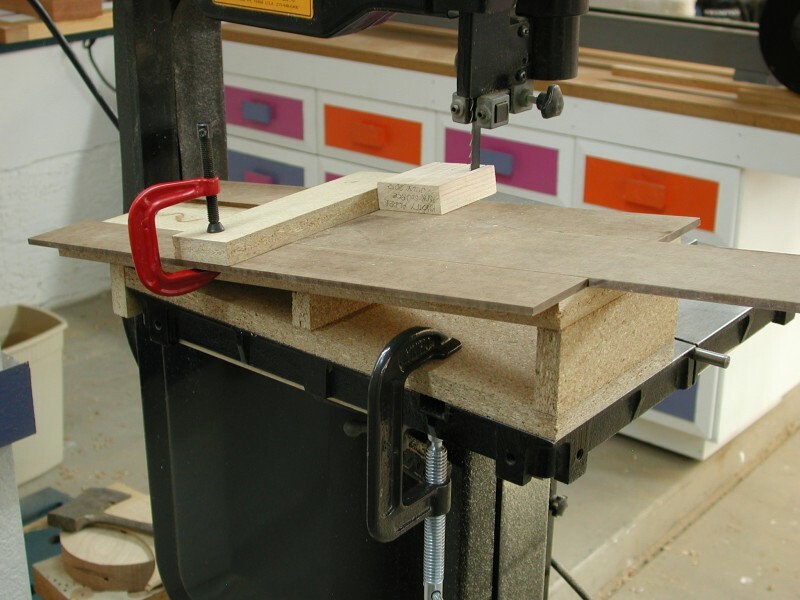 Besides the spacers, Bird and Marks both describe a sloping auxiliary table that you need if your bandsaw doesn't tilt to the left. 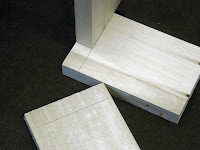 You can cut dovetails even if you can't saw to a line. Yay! You don't need any fancy and expensive equipment. You can size and locate your pins any way you want. 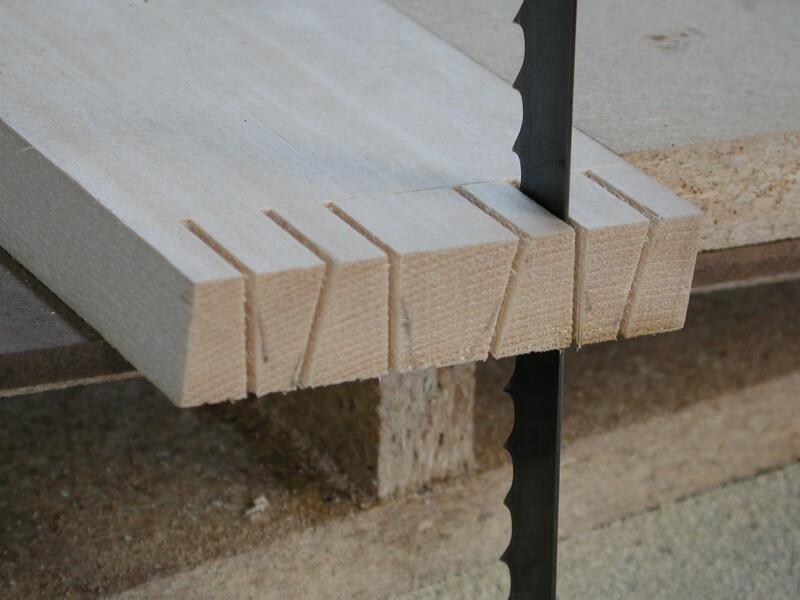 It eliminates most of the tedious measuring and layout required for hand-cut joints. The one thing I don't like is the spacer idea. Making the spacers seems simple enough, but figuring out how wide they should be looks to be fairly confusing. In The Bandsaw Book, Lonnie Bird tells how to make the spacers for evenly spaced pins, but doesn't explain what to do if you want variable pin spacing. Most of the other descriptions I've seen either ignore the problem, or else cop out completely with nonsense like, "some experimentation will be needed to determine the width of the spacers." Great. Rather than messing with the spacers, to me it seems simpler to just mark the desired pin positions, then saw them using the fence to help keep the cuts straight and square to the end of the board. 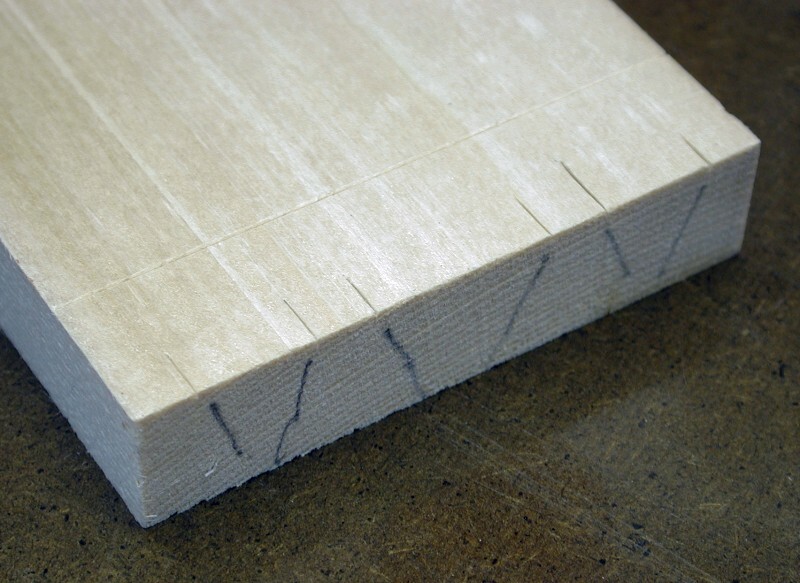 If you're making multiple joints, you still only have to mark one part, set the fence, and then use that one setting for all the corresponding cuts on the other boards. The small cleat on the right side squares the jig with respect to the bandsaw table, while the C clamp just keeps it from moving around. The slope of the platform determines the slope of the pins and tails. The fence assembly slides in a dovetailed (!) 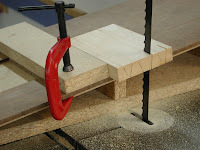 slot in the platform, and is held in place with a second clamp once set. The following images link to PDF files containing detailed drawings of the jig as I made it. It's sized to fit my generic 14" bandsaw. There's nothing especially critical about any of the dimensions, however, so the plans should be easy to modify for use with other bandsaws. I used 5/8" particle board and 1/4" tempered hardboard for my jig. There's nothing critical about that, either. Cutting dovetails using this jig is much like cutting them by hand using the pins-first method, except 1) you use the bandsaw instead of a hand saw to cut the pins and tails, 2) the layout of the joint is much simpler, and 3) if you're doing multiple joints, you only have to do the layout once. 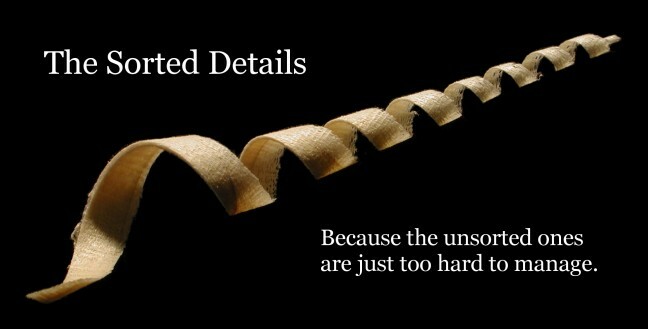 Given that similarity, there's no point in rehashing all the gory details of hand cutting dovetails when they've already been expertly discussed many times before. Instead, I'll just give a quick (?) step-by-step run through, with some pictures to show how the jig works. In case you're new to the subject, there are a couple of entries (Part 1 / Part 2) in Glen Huey's blog that explain the pins-first method in great detail. 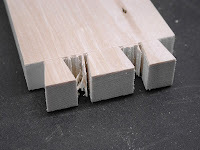 There's also a very nice video in Keri Hultman's blog that's definitely worth a look, if only to see how she uses a big fat plane blade to position a block to guide her chisel. After you've milled your stock to be flat and square in every direction, use a marking gauge to mark baselines on both the pin board and the tail board, just as if you were going to cut the joint by hand. Then lay out the locations of the pins. I like to do this with a knife just for the sake of precision. I also like to make rough pencil marks on the end of the board to indicate the ends of the pins. These don't have to be accurate; they're there simply to reduce confusion when actually cutting the pins. The layout shown has a half pin on each side of the board, with two full pins spaced relatively close to the half pins. This will result in two small tails next to the half pins, and a single, wider tail in the middle. To cut the pins, set up the jig as shown, with the small cleat on the right side and the platform sloping up and to the left. Register the cleat against the edge of the bandsaw table so the jig is square, then secure the jig with a small C clamp. Now hold the workpiece against the fence on the jig, and move the fence so that the bandsaw blade is lined up on the waste side of the mark that defines the half pin farthest from the fence. (This will be the right side of the leftmost half pin as viewed from the normal operator's position.) Apply a small clamp to keep the fence from moving. 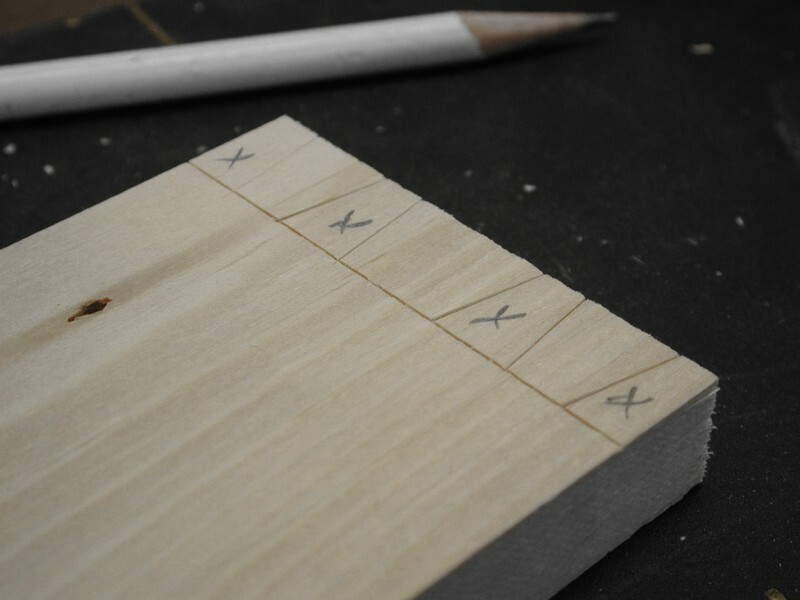 Verify the setup by comparing the blade position with the rough pencil marks on the end of the board. If everything looks good, use the jig's fence as a guide to make the cut from the end of the board to as close to the baseline as you dare. 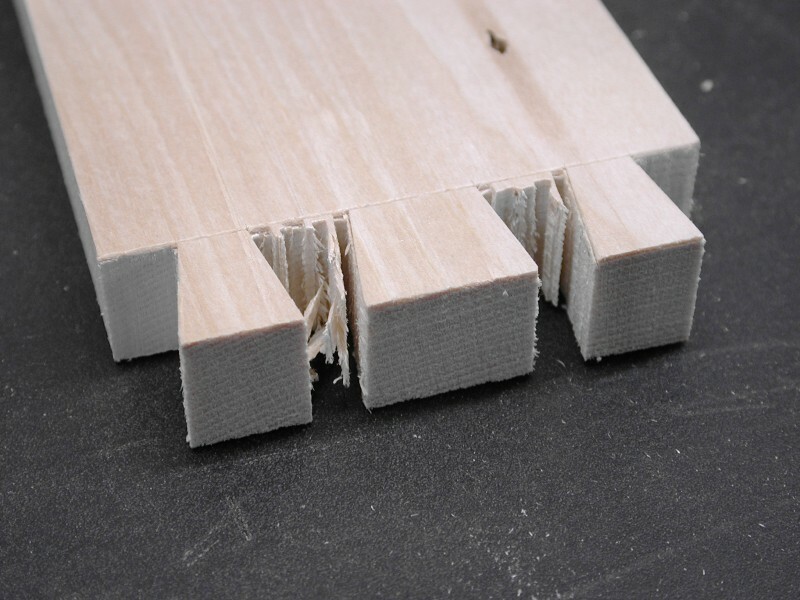 If you are making multiple joints, leave the fence set and make all the corresponding cuts on the other pin boards. Now move the fence so the blade is lined up with the right-hand side of the next pin. As before, clamp the fence in position and check the blade position against the pencil lines on the end of the board. When everything is ready, make the cut. Repeat this process until you have a cut on the right-hand side of all the pins on all of your pin boards. To finish cutting the pins, turn the jig around 180 degrees so the cleat is registered against the left side of the table, and secure it with a clamp. Now the board will be angled the other way and you can make the cuts on the left sides of all the pins. 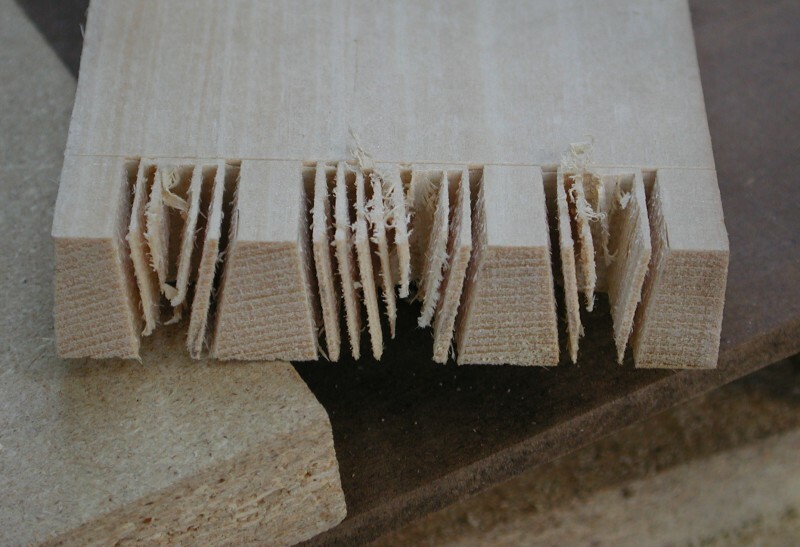 With all the pins defined, you can use the bandsaw to remove much of the waste between the pins. Do this by making repeated freehand cuts in the spaces between the pins. Stop these cuts 1/16" or so from the baseline, and make sure that you do not cut into any of the pins. 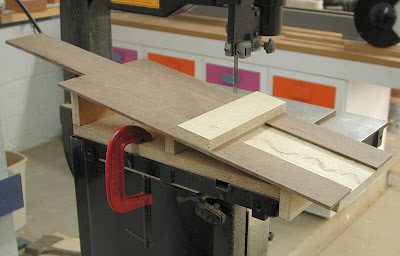 Finally, break out the thin slivers left by the bandsaw, then chop the remainder of the waste from between the pins using a chisel in the traditional way. Mark the tails from the pins just as you would if you were cutting the joint by hand. Again, I like to use a knife for greater precision, followed by a tap with a chisel if needed to make the marks deeper and easier to see. With the jig removed from the bandsaw, carefully saw out the tails freehand. Make sure to keep the blade on the waste side of the cut line, and don't cut past the baseline. As you did with the pins, make repeated freehand cuts between the tails to remove most of the waste in preparation for chopping. Finally, chop the remaining waste from between the tails using a chisel. Adjust the fit, assemble the joint, and throw it on the heap with all of your previous attempts. Nice idea. Thanks for the excellent post! I can't cut a good dovetail by hand to save my life... I'd love to see a video of this in action. Hi, I am always looking for a new dovetail cutting jig that will prevent me from using my non-existent freehand skill. Thanks for this excellent post. 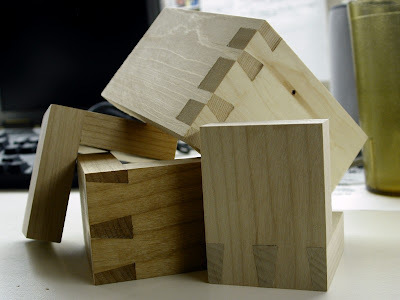 I am wondering if you had a chance to see this jig from Woodworker's Journal, http://www.google.com/url?sa=t&source=web&cd=1&ved=0CB0QtwIwAA&url=http%3A%2F%2Fwww.youtube.com%2Fwatch%3Fv%3DEootxBzj4Yk&ei=ZChkTcaIOsK78gaOmP3nCw&usg=AFQjCNFhzhn7tpm1Ta-QdiM2CA5BVDEBUw? And what you thought of it? A good addition to this would be an adjustable stop so you can cut right to the line every time without worrying about cutting past it. @Anonymous #1: I had not seen that Woodworker's Journal jig, but it does look like yet another good way to go. The only problem I see with the either of the table saw jigs is the difficulty of balancing the workpiece on its end vertically, especially if it's very long and/or skinny. As usual, there are multiple ways to skin this cat. Russ..fantastic idea, whether the BS can tilt or not. This is much faster and consistent over time. I'm stealing it! !